This is the latest entry in our ongoing countdown of the Top 25 RPGs of all time. This week: Sega's conclusion to the Phantasy Star story stands toe-to-toe with the SNES' best RPGs. The Super Nintendo is home to some of the greatest RPGs ever made, but that doesn't mean Nintendo faithfuls living in the '90s never felt a twinge of RPG envy when they looked at the Sega Genesis' library. Yes, the SNES has Final Fantasy IV and VI. Yes, it has Secret of Mana, Chrono Trigger, and the first two Breath of Fire games. The SNES, however, lacks Phantasy Star IV: The End of the Millennium. That's a significant omission, even for a console with the full weight of Squaresoft behind it. Phantasy Star IV is a game worth longing for. 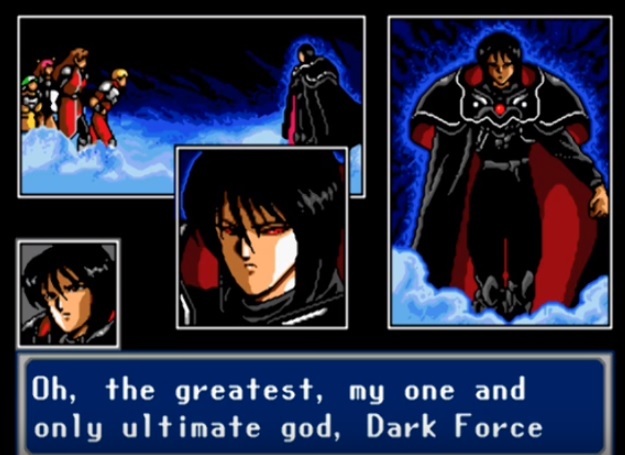 Even the SNES' Final Fantasy entries can't boast a universe as well-developed as Phantasy Star's Algo star system. It's populated by an intriguing cast of cyborgs, machines, human-like races, and aliens—all with their own histories and cultures. It has dire threats that plague generations of heroes across millennia, and it all comes to a head in Phantasy Star IV. Not to say Phantasy Star IV doesn't revel in an RPG cliché here and there. The game starts with two freelance "hunters," Chaz and Alys, on a mission to clean monsters from an infested basement. The story doesn't wait very long before the stakes are thrown sky-high, however. You quickly learn the characters' home planet of Motavia is experiencing rapid desertification, though the realm's rampaging bio-monsters might decimate the population long before the hostile climate gets a chance. Bad times make for efficient dictators, and sure enough, a dark magician calling himself Zio promises to raze the remnants of Motavia and build a lush new society out of its ashes. Unsurprisingly, there's something worse behind Zio—something much, much worse that's been haunting Phantasy Star's hero characters across four games spanning thousands of years. Phantasy Star IV isn't as visually appealing as Final Fantasy VI or Secret of Mana, but that's by design. Motavia is a dying planet, and its arid landscapes reflect its decline. The bleak brown environments and sterile mechanical corridors you travel through are broken up by bright manga-style cutscenes that make for effective interludes and character development. Phantasy Star IV's fights are technically impressive, too: Each character has a unique attack animation, and the monsters (who are also animated) are intimidating. Some bosses take up the entire screen. Phantasy Star IV's world is bleak, but its character designs and cutscenes inject a lot of character into the game. 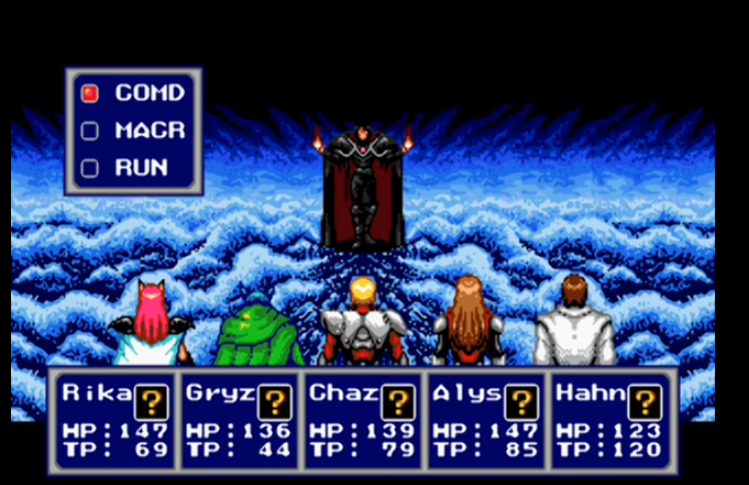 Fights in Phantasy Star IV are turn-based, as per 16-bit RPG tradition, and characters can combine techniques for powerful combo attacks. Phantasy Star IV's combat isn't its best trait, in my opinion. Its rapid-fire random encounters are easy to get tired of—but that's typical of most RPGs from the same era. What sets Phantasy Star IV apart as one of the greatest RPGs of all time is its eagerness to tell a story that never talks down to its players. Main characters suffer permanent deaths. Its narrative manages to tie up the three previous games without making newcomers feel like interlopers. Zio is a genuine threat, and his followers are rabid beyond reason; you come across brainwashed townspeople who thrash in religious ecstasy. Even Zio's paint-by-numbers schpiel about creating a new world from the ashes of Motavia becomes much more unsettling when you notice his right-hand man, Juza, wears a frock with three downward-facing triangles on it—the symbol for nuclear weapons, radioactivity, and fallout. And it might be wishful thinking on my part, but there's a lot about Phantasy Star IV (and Phantasy Star in general) that reminds me of Madeleine L'Engle's Time Quintet series of young adult novels. The games' mix of magic and science fiction, not to mention Phantasy Star IV's conclusive struggle of heroes versus a black entity that wishes only for the destruction of all life, is reminiscent of A Wrinkle in Time, a Swiftly Tilting Planet, and some of L'Engle's other works. The icy fog roiling around your ankles means everything's great. True to its name, Phantasy Star IV: The End of the Millennium was an ending. There hasn't been a follow-up title outside the Phantasy Star Online games and Phantasy Star Nova, and good luck playing those if you live in the West. Much as RPG fans would love to see a Phantasy Star V, Phantasy Star IV's conclusion doesn't really call out for one. Sega deserves some respect for telling a story with a well-defined beginning, middle, and end instead of meandering all over Algo and leaving loose ends and question marks everywhere. Phantasy Star IV is the very end, my friends, and that's just another reason to lend it a few hours of your time. Tagged with Axe of the Blood God,	Feature,	Sega,	Sega Genesis,	Top 25 RPGs.